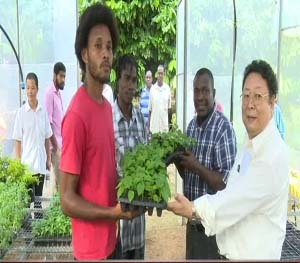 On Thursday, September 22nd, a small ceremony was held to officially commence operations at an EC $55,000 greenhouse gifted by the Chinese Agricultural Mission. That greenhouse was handed over on August 7th, 2015, to the farmers of Castle Bruce. The Chinese Agricultural Mission provides seedlings and trains farmers in seedling production and farming techniques. Farmers and extension officers of the Ministry of Agriculture underwent an eight-week course in crop husbandry and tractor operation and maintenance. 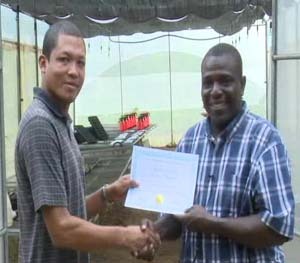 On Wednesday, September 21st, participants were awarded certificates of completion. The Hon Member of Parliament for the Castle Bruce Constituency who is also Minister for Agriculture, Johnson Drigo, said this training is very important since he expects a greater demand for agricultural produce from the Castle Bruce area. Now that individuals have received technical training, the Castle Bruce greenhouse is officially open for operations. He added, “First of all, we have a pepper project where six young people are cultivating two acres of hot peppers in the first instance. We expect to propagate over 16,000 pepper seedlings at first. “Secondly, the Castle Bruce Tourism Organisation is rapidly structuring its self to bring out the eco-tourism strength of Castle Bruce. “We anticipate that the greenhouse will not only produce vegetable seedlings but we will propagate flowers to enhance the bay front and the entire community as we prepare for the eco-tourism project on which we are embarking. The Hon Minister thanked the People's Republic of China and the Chinese Agricultural Mission for the financial and technical assistance provided for the enhancement of agriculture in Dominica.